Help Miguel Get His Lung Transplant! 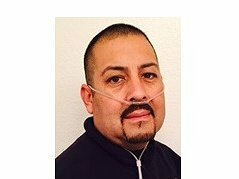 Miguel Garcia is a 41 year old man who has been experiencing lung problems for the past 12 years. Less than 3 years ago, Miguel was diagnosed with Idiopathic Pulmonary Fibrosis (IPF). His doctors at Stanford University Medical Center have told us that his only option is a life-saving lung transplant. Miguel attended Silver Creek High School in San Jose. He is a wonderful partner, father, step-father and good friend to many. Miguel is no longer able to work or do many of the everyday things we all take for granted. He continues to remain upbeat and looks forward to the future when he can return to work, become involved in the community again and spend more time with family and friends. Miguel has always been there for others. Our family is committed to supporting Miguel in what ever way he needs. We also need your help. Transplants are life saving, but financially draining. Even with his insurance, he will have many expenses that are not covered and must be paid out of pocket. Some of these expenses are co-pays, deductibles, a caregiver, and Miguel will be on a life-time of anti-rejection medications. This is where your help is desperately needed. To help with the financial burden of Miguel’s uninsured expenses, a fundraising campaign in his honor has been established with HelpHOPELive, a trusted non-profit organization that has been providing community based fundraising guidance to patients and their families for more than 30 years. All donations are tax deductible, are held by HelpHOPELive in the Southwest Lung Transplant Fund, and are administered by HelpHOPELive for transplant-related expenses only. Please consider a contribution. Click on the Donate Now button on this page to make a donation. On behalf of Miguel and our family, thank you for your kindness, generosity, support and prayers.